This afternoon Ceci & I met up with Robert to stake out a spot on Av Callao to watch the funeral procession of former President Raul Alfonsín . After the procession many in the crowd flowed onto Av Callao to follow the coffin to Recoleta Cemetery, but we decided to take a side street and come up to the cemetery via calle Junín where we found the mounted honor guard lined up outside the cemetery walls. We assumed that there was nothing else to see but we wandered up toward the cemetery anyway. Then we got swept into the surging crowd as an entourage surrounding Alfonsín’s son moved towards the entrance of the cemetery. Then Ceci & I got separated from Robert. Never saw him again. The police were pushing through trying to form a passage so that the coffin could make it to the cemetery. At this point I just held up the camera and turned on the recording mode as the flag-draped coffin moved by. Actually, for quite a while, the coffin just sat there. Not a very good video but definitely a typical Buenos Aires in-the-crowd moment. I love that! But, I later learned that while I was recording this video someone in that very packed crowd stole my wallet. Fortunately, I never carry much money or anything valuable in my wallet, so the theft doesn’t bother me too much. Perhaps the person with the best vantage point of the funeral was this dude in the crane. 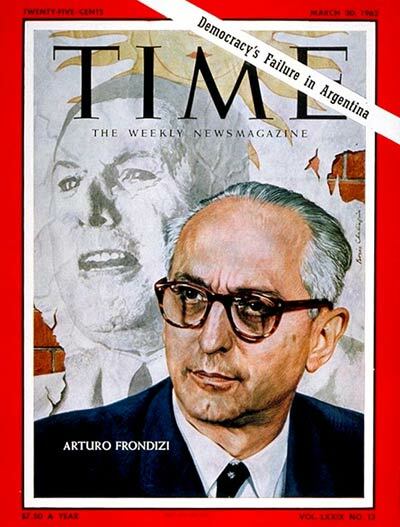 That attention-grabbing headline could have been written about several periods of Argentine history in the 20th century but this particular instance is from the March 30, 1962 cover of Time magazine featuring a portrait of Arturo Frondizi, president of Argentina from 1958 – 1962. The cover story is titled Ghost from the Past, a reference to Perón. In the post-Perón years of the late 1950s there was a lot of economic and political strife with the military closely watching and hampering Frondizi’s function as president. The focus of the Time magazine article is the 1962 congressional and gubernatorial elections that were won by the Peronists in a landslide. The military wanted Frondizi, who had opened the doors for the Peronist party return to politics, to annul the election. For hours on end, a solitary figure sat stiffly in an ornate office in Buenos Aires’ presidential Casa Rosada. A few lifelong personal friends kept an uncomfortable vigil in an ivory and green anteroom. Outside the door, a pair of knee-booted grenadiers of the palace guard stood, like life-sized toys, with ceremonial sabers bared. A stream of messengers came and went, bearing bulletins. Arturo Frondizi, 53, President of Argentina and currently his country’s most unpopular man, was waiting to see whether he would be allowed to remain as elected Chief Executive of South America’s second biggest nation. There are a few editorial interjections that color the article as an artifact from the U.S. perspective such as the constant pairing of the word dictator alongside the name of Juan Perón and the reference to “Che Guevara’s Red mother Celia” showing up at a Peronist rally. Time also couldn’t help but point out that the sixty-six year old Perón (as of 1962) “lives in luxurious exile with his two poodles and 27-year-old Isabel”, foreshadowing another calamitous presidency. What’s not mentioned in the article, occurring just after the magazine had gone to print, was the arrest of Frondizi by the military. The article does raise the intriguing question: how did the military, which had not fought a war since 1870, control Argentina for much of the 20th century? Some photos from Monday’s Fiesta de la Democracia in Plaza de Mayo. The crowd wasn’t nearly as large as it looks in the photos or on TV. Everybody was crammed into the part of the Plaza that is nearest the Casa Rosada. On the other side of the security fence that runs across the Plaza were very few people. For most events the security fence is used to keep the crowd far away from Casa Rosada. This time the fence came in useful to make it appear that there was a larger crowd. As I mentioned in Monday’s post, if the Kirchners hadn’t bused in a ton of supporters then there would have been very few people present. Befitting a peronist shindig, wandering through the crowd was a guy selling huge photos of Evita. Not much to say about today’s presidential election in Argentina, certainly no surprises. I don’t have a problem with a Cristina presidency. 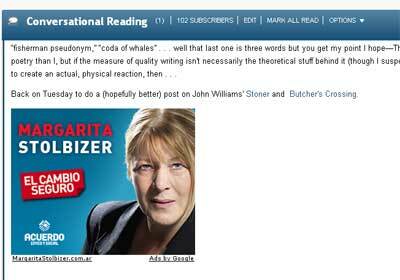 Indeed, all the top three candidates – Cristina, Lavagna, Carrió – seemed okay to me. I do have this theory that Cristina might give a further boost for tourism to Argentina just through the inevitable appearances she is likely to make on the E! channel based on her fashion sense. Continuing with our look at the political posters for the upcoming city elections…. This has to be one of the oddest political posters around town. At first, I thought it was a pro-Macri poster with its big letters of “Vote Macri” but I was confused since I didn’t know my Macris too well. Did Macri shave off his mustache? Did he lose it jumping over a pothole? Then it was pointed out to me that this photo is of Macri’s father – Franco Macri, a local business tycoon with a dubious reputation. The slogan underneath the photo says “Business with the state, that is” followed by the symbol for Macri’s political party PRO. The elder Macri made a lot of money from doing business with the state. The poster implies that a Macri government will be filled with corruption. Then again, conservative business types might just be in full agreement that business with the state is the way to go. Do political advertisements in Argentina have to include a statement as to who funded the ad? I don’t think so but it would be very interesting to know in the cases of many the posters. 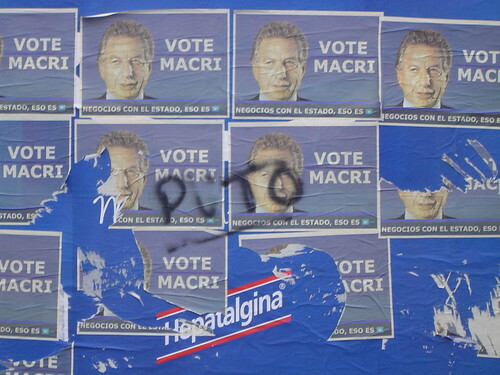 Oh, I almost forgot…as you see in the photo…someone added a derogatory statement over the posters of Macri…since this is a family blog, I’ll leave the translation out.